Today, I want to talk to you about getting older and tai chi benefits. Getting older is inevitable, and it happens to everyone. At the same time, it’s the result of a life well-lived. I’m sure that many of you have had successful careers, and even found the time to settle down and create beautiful families to come home to each day. But, the years have added up to a few aches and pains along the way. Not to mention, there are some weeks you even forget to take out the trash. It likely isn’t the retirement plan you expected. You just wish you had the flexibility and strength to run around in the yard with your grandkids. Well, we all know that there isn’t a fountain of youth or even a time machine to get you feeling like you did in your younger days. But, the ancient Chinese martial art of tai chi could help you feel as if you were that younger self. It is a form of qigong that dates back more than 2,000 years. Its ancient teachings were passed down generations from teacher to student. And now, the practice combines gentle stretching, deep breathing, and even some mindfulness. Tai chi is more than just fancy movements and tempered breathing. It also is great for anti-aging, according to research. A report published in the Official Publication of The State Medical Society of Wisconsin singled out tai chi as a form of exercise especially effective for seniors. The authors even consider tai chi an exercise for maintaining physical performance and preventing disability in older adults. The ancient exercise has been well studied. And, it’s known to benefit those with limited physical abilities, including older adults who are unable to perform intense exercises. Let’s look at some of the key ways tai chi benefits older adults. About one-third of the elderly who are over age 65 have a habit of falling each year. At the age of 80, that number jumps to more than half of seniors. Over time, tai chi could reduce falls, pains, injuries, and tears. Research even shows that tai chi improves bone mineral density, balance, and muscle strength. Tai chi is also great for improving upper-body and lower-body flexibility. Although getting older often reduces the strength of certain muscles, tai chi could help restore muscle strength and coordination. Tai chi is much more than an exercise. It could even promote greater self-awareness. Studies show that tai chi may even reduce stress, anxiety, and depression in a similar way as yoga or other mind-body exercises. Osteoarthritis is one of the more common types of arthritis. In the U.S., it affects around 80% of those over 50. So, it is a good thing tai chi could help with osteoarthritis as well. Research shows that tai chi produces benefits similar to physical therapy when it comes to treating symptoms of knee osteoarthritis. A systematic review and meta-analysis from 2015 showed that tai chi has the potential to enhance cognitive function in older adults. Studies also suggest that the slow pace of tai chi helps improve attention span, which is perfect for older adults unable to focus. Although tai chi is considered safe and can benefit nearly anyone, young or old, there are a couple of things I want you to keep in mind before you begin practicing. First, if you have an injury still healing, are taking a medication that can make you lightheaded or dizzy, or suffer from any musculoskeletal problems, it is best to speak to your doctor before you head to your first tai chi class. Secondly, many senior or community centers offer tai chi classes at a reasonable price. I recommend that tai chi beginners take an instructed class to safely learn the movements, while also getting valuable feedback from the teacher. Kuramoto, A.M., “Therapeutic benefits of Tai Chi exercise: research review,” WMJ, October 2006; 105(7): 42-46. https://www.ncbi.nlm.nih.gov/pubmed/17163086. 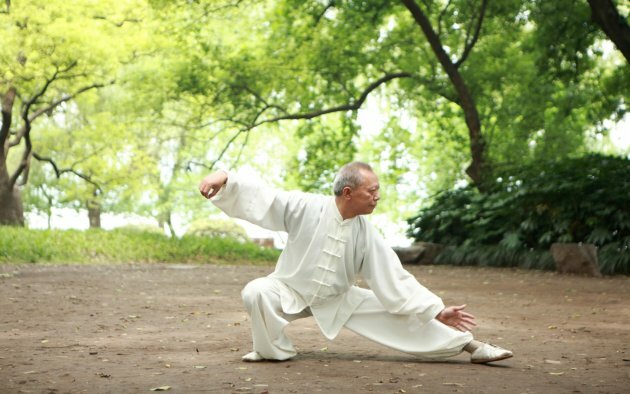 Song, Q.H., et al., “Effect of Tai-chi exercise on lower limb muscle strength, bone mineral density and balance function of elderly women,” International Journal of Clinical and Experimental Medicine, June 15, 2014; 7(6): 1569-1576; https://www.ncbi.nlm.nih.gov/pmc/articles/PMC4100967/. Wayne, P.M., et al., “The Impact of Tai Chi on Cognitive Performance in Older Adults: A Systematic Review and Meta-Analysis,” Journal of American Geriatric Society, January 2014; 62(1): 25-39. DOI: 10.1111/jgs.12611. Wang, F., et al., “The effects of tai chi on depression, anxiety, and psychological well-being: a systematic review and meta-analysis,” International Journal of Behavioral Medicine, August 2014; 21(4): 605-617; https://www.ncbi.nlm.nih.gov/pubmed/24078491. Prieto-Alhambra, D., et al., “An increased rate of falling leads to rise in fracture risk in postmenopausal women with self-reported osteoarthritis: a prospective multinational cohort study (GLOW),” Annals of the Rheumatic Diseases, May 31, 2016; 72(6)L 911-917. DOI: 10.1136/annrheumdis-2012-201451.